George Graham Reviews "Corky Siegel's Traveling Chamber Blues Show"
This radio program, by definition, encompasses a wide swath of genres. So I take special delight in music that within itself crosses boundaries. This week we have new CD from someone who has been mixing seemingly diametrically opposed styles for more than 30 years. It's Corky Siegel, whose new CD is called Corky Siegel's Traveling Chamber Blues Show, and it's the first live recording by a wonderfully distinctive group that combines blues with a string quartet and Indian tabla percussion. Corky Siegel has been prominent on the music scene since the mid-1960s, when he and Jim Schwall formed the fabled Siegel-Schwall Band in Chicago, which brought a greater degree of blues authenticity to the then-burgeoning blues-rock scene which was dominated by young British musicians like Eric Clapton. Siegel-Schwall became part of the hard-driving Chicago electric blues scene, with Siegel striking up friendships with both Muddy Waters and Howlin' Wolf, often performing his harmonica with them in Chicago's famous blues club Pepper's Lounge. Classical conductor Seiji Ozawa, who was then conducting the Chicago Symphony, became a blues fan and would often hang out at the city's blues clubs, where one night he approached Siegel and his band about performing with the orchestra. Windy City based composer William Russo was commissioned to write a piece that would bring the two together. The result was Three Pieces for Blues Band and Symphony Orchestra, first performed in 1968. It was eventually recorded with Ozawa and the San Francisco Symphony and released in 1973. It became one of the most popular classical albums of the decade. The Siegel-Schwall Band has continued on and off to this day, but the fusion of classical and blues became a passion for Siegel, and he continued such collaborations when he could. Then in 1983, Siegel decided to form a regular band for the purpose he called Chamber Blues, involving a string quartet and Siegel's blues harmonica. At the time, Siegel had been given a commission to create new music for a Grant Park performance by the National Symphony. Siegel has been maintaining Chamber Blues as a regular project ever since. They released their first CD in 1994, simply called Corky Siegel's Chamber Blues and it was a delight, combining the lightness and flexibility of a string quartet that could not be duplicated by a whole orchestra, and making music that was as good-natured and immersed in a spirit of fun as it was eclectic. They followed their debut four years later with Complimentary Colors, which continued the group's efforts to blur the lines between what is supposed to be classical and what is supposed to be blues. The blues, like jazz, is very much music of the moment, with significant opportunities for improvisation, and very much interacting with the audience. So for this latest project, Siegel and company decided to record live before audiences in venues from jazz clubs to symphony halls, to the amphitheater at Chatauqua, New York. The result is music that indeed derives energy from the audience and is stronger on the improvisation, proving that a string quartet, or at least its individuals, can jam with the best of them. The group again includes percussionist Frank Donaldson, whose career includes both a stint with the soul band Archie Bell and the Drells, and classical work. The string players are Mark Agnor and Jeff Yang on violins, Nell Flanders on viola, and original member Jill Kaeding on cello. There are a couple of other guests, including jazz violinist Randy Sabien, and Rollo Radford, the bassist from the original Siegel-Schwall Band. The material is mostly new, though there are some altered versions of two pieces previously recorded by Chamber Blues. There is a mixture of more composed pieces and material that allows greater opportunities for jams by all the members. There's also a mixture of vocal and instrumental material, as there had been on the previous Chamber Blues releases. When I reviewed the second Corky Siegel Chamber Blues CD nearly seven years ago, I said that now that the novelty of mixing blues and classical had been presented, they needed to move beyond that into making significant music. They did indeed do that. Now, this infrequently-recorded group has settled into a comfortable ensemble, and a live recording is an excellent follow-up to their genre-bending studio releases. 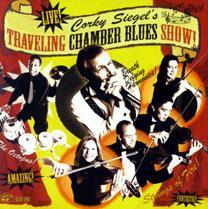 Corky Siegel's Traveling Chamber Blues Show emphasizes the group's spirit of good fun, and also shows that a string quartet can jam. It makes for music that is not only a very distinctive cross-cultural blend, but also genuinely entertaining and musically infectious. For sound quality, we'll give the CD an "A." The previous Chamber Blues CDs were sonically stellar, with a clarity that virtually leapt out of the speakers. This live recording is not as spectacular, but it still has clean, unprocessed sound and good dynamic range, qualities from the classical recording world that have become nearly extinct among rock CDs. In recent years, stylistic mixtures have been devised in a bewildering number of permutations. Classical and blues still seem miles apart, but for over a decade, Corky Siegel's Chamber Blues has been taking this ostensible culture clash and turning it into some very enjoyable music.